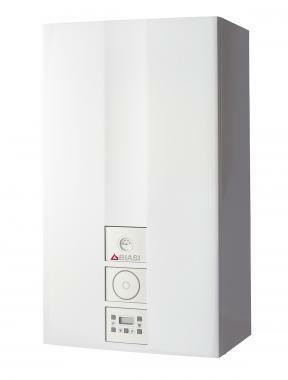 The Advance Combi boiler from Biasi is a gas fired condensing unit which has been designed to be wall mounted. While the boiler is extremely compact in size it is still powerful enough to deliver up to 13.3 litres of hot water per minute with an impressive efficiency rating of 89%. As a Combi boiler it will supply hot water and heating on demand directly from the mains water supply. This means you don't need to have a bulky tank or cylinder which makes it perfect for homes where space is precious. This boiler has an output rating of 30kW making it perfectly suited for the medium sized home with one bathroom and not such an excessive need for heating and hot water. Other available options include 25kW and 35kW. A key feature is the high grade stainless steel coil heat exchanger that is extremely robust yet still efficient, with the coil oval section allowing the system water to flow freely through the heat exchanger to prevent dirt and debris. It has a visible pressure gauge, simplistic controls and an optional switchable mechanical clock for easy use. This boiler comes with built in weather compensation technology via a simple temperature probe that enables the boiler to automatically adjust in line with the outside temperature. This means on colder days the boiler will work harder to heat your home and will conserve energy on warmer days. A 5 year warranty is included as standard so you can be sure that this boiler is not going to let you down.